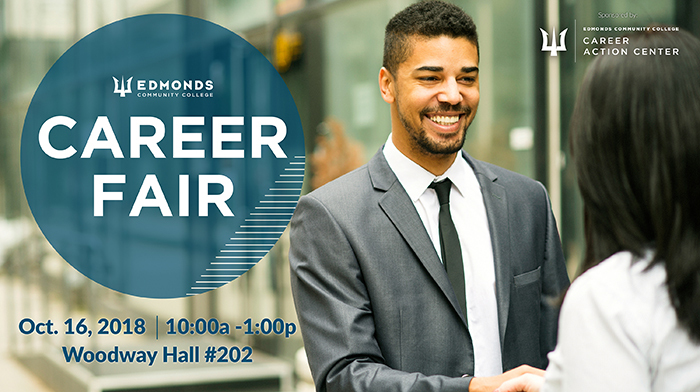 Edmonds Community College will host a fall quarter career fair on Tuesday, October 16, 2018. Approximately 40 local employers with full-time, part-time, and seasonal employment opportunities will be present. The event will be held from 10:00 am to 1:00 pm in Woodway Hall 202 on campus. This free event will feature local employers recruiting from the following industries: health care, hospitality, legal, engineering, marketing, administration, retail, child care, information technology, manufacturing, and more. Attendees gain valuable networking and employment opportunities.